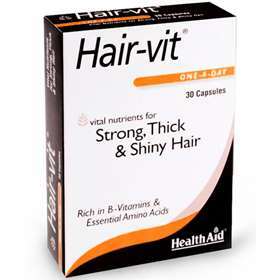 Health Aid Hair-vit provides the vital nutrients needed to form and maintain healthy looking hair. Hair-vit Contains B Vitamins and essential Amino Acids which support strong, thick hair and nurtures the texture and colour of your hair. Rich in B Vitamins and Essential Amino Acids. Free from gluten, wheat, dairy, lactose, starch, artificial colours, preservatives and flavourings. Take one capsules daily with breakfast. Capsule Shell agent (gelatine), humectant (glycerol, purified water), natural colours (black, brown, red iron oxides)], Bulking Agent (soybean oil, yellow beeswax, palm oil, coconut oil), di-Calcium Phosphate, Yeast Basic, Choline Bitartrate, Inositol, Hydrolysed Gelatine Powder, Ferrous Sulphate, Dl-Methionine, L-Cysteine HCl, Nicotinamide, Soy Lecithin, Thiamin Mononitrate, Riboflavin, Pantothenic Acid (calcium pantothenate), Para Amino Benzoic Acid, Vitamin B6 (pyridoxine HCl), Zinc Sulphate, D-Biotin, Vitamin B12 (cyanocobalamin), Cupric Sulphate, Manganese Sulphate, Folic Acid. **: Provides: glycerine, proline, hydroxyproline, glutamic acid, alanine, arginine, aspartic acid, serine, lysine, leucine, valine, threonine, phenylalanine, hydroxylysine, isoleucine, methionine, histidine, tyrosine.